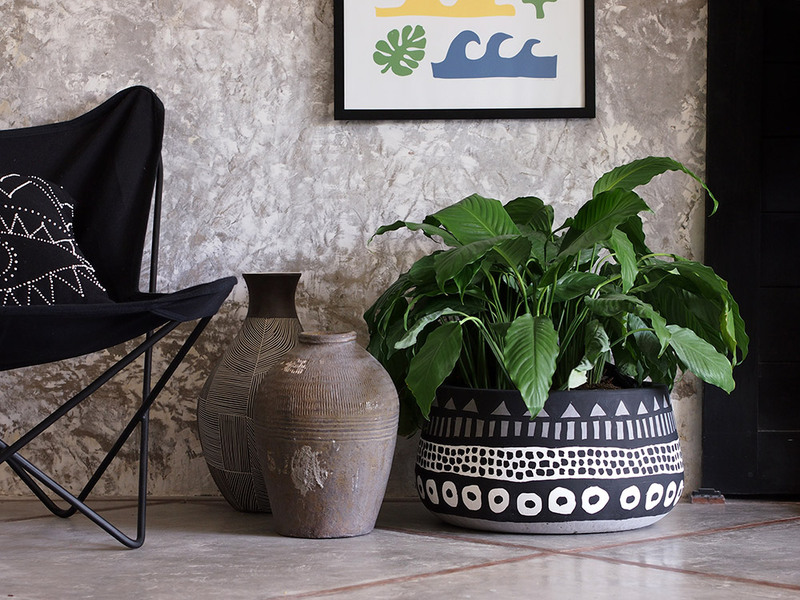 The concrete pots were hand crafted by Slab Interiors, and then hand painted using acrylic paints by Stuart Smythe in his home studio in Bali, Indonesia. Stuart applied some of his iconic mandala influenced black and white designs onto each of the planters, creating an amazing and distinctive limited edition of only 12 unique concrete pots. The Slab Interiors pots are hand made and hand polished in Bali using as much natural and local materials as possible. They use a mixture of locally harvested coconut husks and Balinese volcanic sands in the concrete mix, so there is a little piece of ‘the island of the gods’ in every one of the planters. These pots are the perfect way to add a unique, one-of-a-kind art piece, and some lush greenery, into your home, cafe, office, store or villa. We all know that a few carefully placed plants can completely transform an interior space and even better if the plants are placed in a beautifully painted pot. Shot on location in Berawa, Bali at Sarah from Sancerre's amazing villa. Please Contact Us if you are interested in purchasing one of these pots. Please note these are currently only available in Bali. You can also contact Slab Interiors if you would like to make a custom order of concrete pots for your home or business.